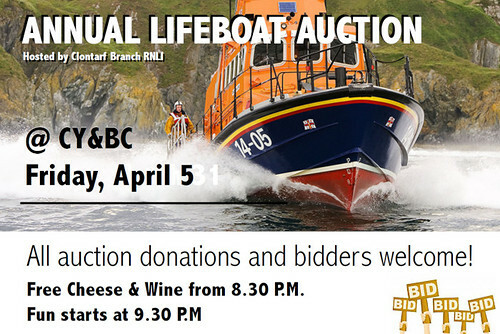 The lifeboat auction is this Friday (5th April) in the Club. The auctioneers are Gary Sargent & Elaine Ball so the craic is guaranteed. We will be starting on time as many supporters will be involved at 06.00 on Saturday for the cruiser launch. Many excellent items on offer at the auction including vouchers for Irish Ferries and Stena Line. Please bring items for auction. Complimentary wine and cheese for those who come early – from 8:30pm to 9:30pm. Please note bar will close at 00.15 hrs to allow for staff to go home ( they are involved in the cruiser launch on Sat). Pleas support this worthwhile function.